Note: You need Deep7's Battleforce Bravo main rules to use the product! 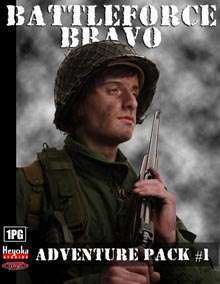 Have you used up all the scenarios from Battleforce Bravo yet your players are asking for more? Supplement your grunt's dangerous life with five new scenarios! During a mission to destroy an enemy fuel dump, the Patrol’s radio is wrecked and they are unable to warn HQ of a large Nazi anti-tank outfit waiting in ambush. The group are aware that the town of El Jebel has a huge radio broadcast unit, with the idea of capturing the radio and passing a message back to HQ. The characters are members of the British Expeditionary Force. They are a part of one of the units that formed the rearguard to hold back the German advance whilst the Dunkirk evacuations of 26 May to 4 June 1940 take place. It is now 5 June 1940 and the bulk of the BEF have been rescued; the characters are stranded in enemy territory and on the wrong side of the English Channel. Having broken out of Calais, the characters are heading towards Le Havre through occupied territory, where they understand there are still British forces that they can join up with. Admiral Canaris, head of the Abwehr, is ordered to carry out the seemingly impossible task of capturing Prime Minister Winston Churchill and returning him to the Reich. Churchill is scheduled to visit an airfield near the village of Uphampton. The German squad of 12 men has parachuted into England, near to Uphampton, dressed as British infantrymen. They will then make preparations to ambush the convoy, capture Churchill and escape by stealing a plane from the airfield and flying it back to the Fatherland. England throws wave after wave of bombers across the Channel, but somehow the Lufwaffe is able to shoot them down at will. News reaches the British Air Command of a secret German radar installation based on a small island off the coast of German-occupied Denmark. It seems that this must be the secret weapon that the Nazis have been employing against the British Air Force. A daring raid is required to destroy the base before Britain launches its next bomber assault against Germany. This title was added to our catalog on October 21, 2007.